Not so long ago, affordable monitors were a case of anything you fancied so long as it was TN. More recently, screens with IPS and VA panels have been coming thick and fast. Hallelujah! The latest member of this new monitor army is the Philips Brilliance 241P4QPYES. It sports what Philips calls an AMVA panel. Think of it as the latest iteration of the MVA breed, which in turn is a particular flavour of VA (vertical alignment) LCD panel. That typically means much better colours, contrast and viewing angles. The only slight snag is that the competition among the £200-ish, better-than-TN brigade is hotting up. Dell has been flogging eIPS screens for a while, while BENQ prefers to go with VA tech. Meanwhile, ViewSonic has just launched an IPS-based screen, the VP2365-LED. And it's very, very good indeed. 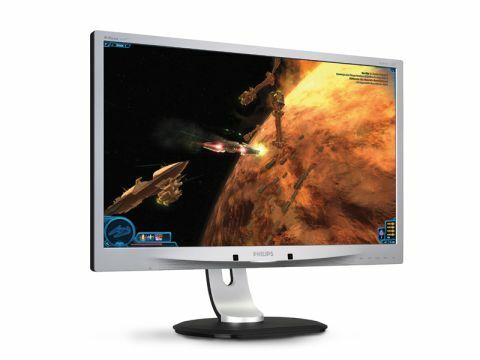 Specs-wise, the Philips Brilliance 241P4QPYES certainly looks promising. That AMVA panel is claimed to be good for 178-degree viewing angles in both planes, 6ms response times and static contrast of 5,000:1. Factor in the LED backlight and good connectivity, which includes HDMI, DVI and VGA, and you have a very promising package. You even get a fully adjustable stand that lets you rotate the monitor to portrait mode. More predictable is the combination of a 24-inch diagonal and 1920 x 1080 pixel grid. For PC use we'd prefer the slightly taller 1920 x 1200p alternative, but that's asking a lot at this price point. Philips has also thrown a few image enhancement options into the mix. We're not big fans of dynamic contrast, but it's offered here and since it's switchable, everyone wins. The same goes for pixel overdrive, a technology used to improved response times. It's known as Smart-response in Philips' parlance, and again it's fully switchable. As it happens, we found it delivered noticeably better response when enabled, without introducing any inverse ghosting or input. As for the other image quality metrics, most are pretty impressive. Colours are rich without being over-saturated. Black and white scales both reveal excellent detail, and there's little evidence of colour compression. Gradients are rendered impeccably and there's plenty of depth to the contrast. Less impressive are the viewing angles which can't quite match the best IPS screens. The overall brightness isn't exactly stellar either, leading to slightly dirty looking whites. While the Philips Brilliance 241P4QPYES's chassis is very adjustable and well featured, it looks cheap, and the four ports of the USB hub are inconveniently located on the rear rather than near the bezel. And as good as the image quality is, things are moving fast right now. A year ago, this MVA panel would have been a world beater. Today, the Philips Brilliance 241P4QPYES is merely very good. There are slightly better screens available for similar money.